Record low mining deaths — but is that enough? January 4, 2010 by Ken Ward Jr. The old year had barely ended before The Associated Press sent out its year-end story that U.S. mine deaths had hit a record low in 2009. The total in the headline and the story — 34 — includes the 18 coal miners and 16 metal/nonmetal miners who died across the country last year. For coal, the previous low was 23 in 2005 and for metal/nonmetal it was 22 in 2008, according to the U.S. Mine Safety and Health Administration. Kentucky led the U.S. with six coal-mining deaths, but that was still a drop from 8 deaths in 2008. Alabama was next with four, and was one of four states that had more deaths last year than in 2008 (the others were Illinois, Louisiana and Tennessee). Here in West Virginia, the three coal-mining deaths was tied for the lowest total ever with 2005. You can check out all of the state-by-state numbers for coal with this MSHA chart. But it’s important not to make too much of such numbers. And personally, I have become wary of these end-of-the-year stories — perhaps it’s just being superstitious, but it’s almost asking for trouble. Several mine safety regulators have expressed the same sentiment to me. And of course, don’t forget that after the record safe year in 2005, we were only two days into 2006 when the Sago Mine blew up. It is historic. And it does tell us we can achieve a point in time when we have no fatalities. I think that’s accomplishable, if you look at where we came from, and where we’ve come to. Everyone who’s involved in mine safety has to be extremely vigilant. There’s very small margin for error in coal mining. The smallest mistake can cost a miner his life. Indeed, it didn’t take long for the U.S. coal industry to record its first death of 2010. Just before midnight on Jan. 2, a worker was killed in an accident in a surface shop at Signal Peak Energy’s Bull Mountains Mine No. 1 near Roundup, Montana. The death came just a few days after MSHA ordered that mine to shut down its longwall after a miner was injured and the company failed to meet federal accident reporting requirements. The blows to our industry’s reputation created by high profile mine accidents impact the safety regulatory environment in which we operate. But I also believe that our poor reputation for safety – however undeserved we think it is – impacts our ability to manage other issues of equal importance to us. If we are perceived as “a dirty business” when it comes to safety, why would our friends in Congress or the agencies work with us on other important issues.This perception even jeopardizes our role as a key provider of energy to the U.S. economy. This past Sunday, for example, Thomas Sowell, the noted conservative economist at the Hoover Institute, wrote that the U.S. could reduce mine accidents if we had more nuclear generated power and less coal-fired power. The message should be clear to all of us. Eliminate the problem. The best way for the industry to close the reputation-reality gap is to eliminate accidents. To be at zero. All of us need to be there. Only when key stakeholders know that mine accidents are the exception rather than the rule will we truly be able to effectively manage the many public policy issues we face. My great-grandfather was a member of the industry’s first mine rescue team. I believe in the importance of safety. I recognize that expecting coal to be a zero-accident industry might be seen as tilting at windmills. But I believe that if we commit ourselves to this goal, we can reach zero. It is within our grasp. Moreover, we owe it to the men and women who go into the mines everyday to produce America’s energy. We owe it to them, and we owe it to their families. We also owe it to the country — because America needs us. We mine America’s energy resources. At about 11:45 pm local time January 2, a surface shop mechanic was killed after being struck in the head at the Bull Mountains Mine No. 1 in Montana. The victim was working on a diesel truck which was supported by jacks when it fell off the jacks, striking him. Ken: To answer your initial question – No, it’s not enough. Mr. Harvey’s comments and commitment to zero fatalities are extremely helpful. It’s good to see others in the industry at least hold out the hope for zero fatalities. But it still remains to be seen if many coal operators will pay more than lip service to this goal. The events in Montana you report would indicate that some, at least, are not. It is also becoming more and more evident that if miners and coal operators want to create an industry with zero or near zero fatalities, they should seek and welcome UMWA representation in their mines. Of the 18 fatalities last year, only one was a UMWA member. In 2008, only 3 of the 30 fatalities were at union mines. In 2007, only 3 of 33 fatalities were at union mines. While there are safety issues at the mines where we represent the workers, it is becoming abundantly clear that union mines are safer mines, especially in this day of tremendous production pressure. As members of a union, UMWA members have the ability to force companies to put safety ahead of production. Workers at nonunion mines simply do not have that option. Mr Smith, while I agree with your numbers. I think that the reason for the low ratios of union to non union deaths are the low numbers of union mines. As for union mines being safer. We at FOLA, a non union operation as you know, won the CONSOL Energy J. Bret Harvey Award last year. It is a company award to the operation that records 1 million man hours with our a medical reportable incident. In 18 months we didnt have one employee that even needed a bandaid at the doctor. Quite a accomplishment from 500 employees. I wonder why that in a company full of union mines, a non union mine won the highest safety award in the company? ARLINGTON, Va. – Preliminary data from the U.S. Department of Labor’s Mine Safety and Health Administration (MSHA) released today indicate that mine fatalities in 2009 fell to an all-time low for the second straight year. Coal mines recorded 18 mining deaths, and metal/nonmetal mines recorded 16 mining deaths, for a combined total of 34 mining deaths nationwide and a significant drop from last year’s total of 52 deaths. According to Main, a key factor contributing to the record low number of deaths include enforcement of the Federal Mine Safety and Health Act of 1977 (which succeeded the 1969 Mine Act) and continued implementation of the Mine Improvement and New Emergency Response (MINER) Act, enacted by Congress in 2006. In 2009, MSHA assessed 173,000 civil penalties for violations of mine safety and health legal requirements. The dollar amount of assessed penalties totaled $140.7 million in 2009. Twenty-five flagrant violations were assessed at a total of $3.4 million. Of the 34 fatalities reported, 11 coal miners and 14 metal/nonmetal miners died at surface mines, while seven coal miners and two metal/nonmetal miners died at underground facilities. 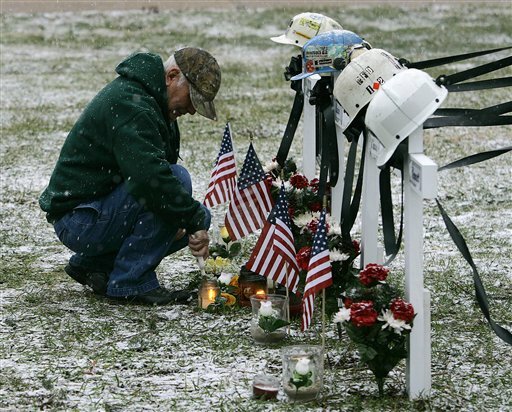 Seven coal miners and five metal/nonmetal miners died in accidents involving powered haulage, the leading cause of all fatal mining accidents in the U.S. during 2009. From Oct. 19, 2008, to June 9, 2009 – a nearly eight-month period – no underground coal mine fatalities were reported, with the total number of underground coal mine deaths about half the previous historic low. Main emphasized that, while the numbers indicate vast improvements in safety, much work remains to be done on the health side. To that end, MSHA launched a comprehensive program last month to end new cases of black lung among the nation’s coal miners. Based on recent data from the National Institute for Occupational Safety and Health, cases of black lung are increasing among the nation’s coal miners. Even younger miners are showing evidence of advanced and debilitating lung disease from excessive dust exposure. How is a report prepared by an organized labor group more “independent” than the one that Davitt McAteer’s team prepared? Scott 14: Congratulations to you and all your co-workers on your award. It was well deserved. I would point out that Fola is (I think) the only largely surface mine that Consol owns, though there is a relatively new underground part of the mine. While safety is important at every mine, underground mines are inherently more dangerous than surface mines, and all the Consol mines where we represent the members are fully underground mines. I would also say that, with regard to the level of union representation, statistics from the U.S. Energy Information Agency indicate that that, on average over the last 7 years (2003-2009), about 3 in every 10 coal miners is a union member over the last 6 years. But only 1 of every 10 miners killed at work has been a union member over that same period. I think that is a telling statistic that allows you to compare apples to apples. Statistically, miners who work at union mines have a significantly reduced chance of being killed at work. Ken: We had no dog in that hunt. We did not represent the workers, were not seeking to represent them despite the lies the company spread at that time, we had no preconceived notions one way or the other about what happened there. We did not have the taint of failures either of commission or omission that the operator and safety agencies had prior to the tragedy at Sago. We felt it was very important that there be an independent voice looking out for the benefit of the workers at Sago, and that’s reflected in the report we produced. That said, I shouldn’t have implied that Davitt’s report wasn’t independent. It was. Ken: A correction to what I said above — after a conversation with UMWA Director of Occupational Safety and Health Dennis O’Dell, I am reminded that our friend Davitt was appointed to lead his investigation by Gov. Manchin and was, in effect, acting as the head of the state’s investigation. He did a commendable job of opening up the process to the public, but he was still working for the state of West Virginia and not an independent. A further correction … the West Virginia Office of Miners’ Health, Safety and Training did its own, separate investigation. Davitt was not in charge of the state’s investigation. My apologies for not mentioning the UMWA report on Sago. I certainly should have, and not doing so was certainly unintentional. United Mine Workers investigators on Thursday said friction between roof rocks and metal roof supports – not lightning – ignited the explosion that led to the deaths of 12 workers last year at the Sago Mine. UMW officials blasted two previous state reports that blamed lightning, saying they were “disingenuous” and based only on circumstantial evidence. Union safety officers believe roof conditions inside Sago’s old “2 Left” section worsened after a series of roof falls forced the sealing in late 2005 of the area where the Jan. 2, 2006, explosion eventually occurred. “Based on the facts of the investigation, the United Mine Workers of America finds that the most likely cause of the explosion was frictional activity from the roof, roof support or support material igniting the methane-air mixture,” the UMW report concluded. While you are certainly entitled to advocate for your side, you are at best over simplifying the situation. There are a variety of factors that influence workplace safety. Probably the biggest single factor being the size of the company operating the mine. All of the biggest coal companies are deeply committed to safety and commit significant resources to training and engineering. The fact that almost all remaining union mines are now part of large companies, and are also concentrated towards inherently safer operations -surface and longwall- and also tend to have an older more experienced workforce all play a part in the numbers you mentioned. The fact is times have changed. Miners know their rights and the regulatory agencies won’t let them break the law. If one wanted to play Devil’s Advocate – which I don’t necessarily – they would mention that the greatest drops in fatalities/year have occurred as the percentage of union mined coal has dropped drastically. Let’s be happy that this year was the best ever, and hope to do even better this year. Equal opportunity made a great point. The average age of a union miner is much older than a non-union miner. I don’t have statistics to back that up, just from what I’ve seen in life. Most union mines won’t hire someone that hasn’t had years of experience, much less a redhat.